We are a leading Exporter of operation theater air condition, hospital air conditioning, cleanroom solutions, pharmaceutical cleanroom, hospitals cleanrooms and sterile room from Chennai, India. SunGreen in its continued endeavor to provide custom engineered conditioning systems as Operation Theatre Conditioning provide precise engineered, energy efficient cleanrooms to exactly meet the exact process requirements. Our custom engineered cleanrooms includes services for various applications including pharmaceutical, industrial, hospitals, Semi conductor etc. 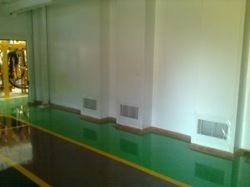 Indoor air quality Hospital Air Conditioning is of paramount importance for human comfort and health. Air, whether it is from outside or re-circulated within the area, acts as a vehicle for airborne contaminants brought in by the movement of people, material, etc. Since many of these airborne contaminants are harmful either to products or people working in such environments their removal is necessary and hence the requirement for cleanrooms. SunGreen in its continued endeavor to provide custom engineered conditioning systems, provide precise engineered, energy efficient cleanrooms to exactly meet the exact process requirements.Our custom engineered cleanrooms includes services for various applications including pharmaceutical, industrial, hospitals, Semi conductor etc.Precise temperature and humidity requirements inside the space could be achieved with various refrigerant options including R410a. We offer comprehensive Clean Room Solutions that adheres to the standards of statutory validating and certifying agencies like USFDA and EUGMP. It is best suited for pharmaceutical companies, food processing industries, precision engineering segments and electronic hardware manufacturers. The raw material used in the production process of this assortment is sourced from the renowned vendors of the market to ensure that the finished gauges are flawless in all aspects. 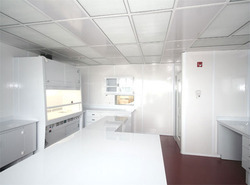 Many Biotechnology and Pharmaceutical Cleanrooms are specified at class 1000 to 100,000. Particulate is a concern however; contamination, the ability to keep the room clean typically using modular or stick built components with integral cove bases, cove corners, and coved ceilings to maintain a cleanable surface condition is crucial. Biotech and Pharmaceutical cleanrooms tend to be sanitized in different ways and the different products are applicable depending on the sanitization methods employed. Concealed areas for bacterial growth are unacceptable. 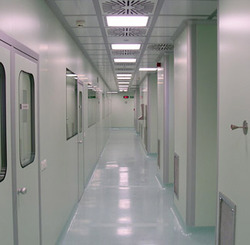 These rooms typically use technology that allows the seal of the cleanroom to not be broken if sanitation occurs and if filter changes must occur. Biotechnology and Pharmaceutical cleanrooms typically focus heavily on the pressurization control, elimination of cross contamination and filtration of outdoor air as well as indoor air. At SunGreen, we design our cleanrooms to be energy efficient, our systems have utilised upto 60% lesser energy that conventionally designed systems. Precice energy efficient Cleanrooms. 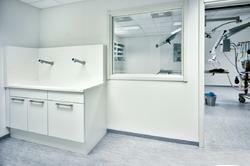 We offer Hospitals Cleanrooms as indoor air quality is of paramount importance for human comfort and health. Air, whether it is from outside or re-circulated within the area, acts as a vehicle for airborne contaminants brought in by the movement of people, material, etc. Since many of these airborne contaminants are harmful either to products or people working in such environments their removal is necessary and hence the requirement for cleanrooms. SUN GREEN Ventilation Systems Pvt Ltd. make Sterile Room, provides the premium solution to meet your garment storage needs while making a positive contribution to maintaining the cleanliness of your controlled cleanroom environment. Cleanroom garments can accumulate particulate contamination during storage and between laundry washes, which in turn may lead to lower product yields and increased product quality issues. These garment storage cabinets are equipped with a blower and a hepa filter in a fully contained enclosure constructed of powder-coated steel sheets, which will not shed particles or contaminate the environment of your clean room. they provide a solution for storing your clean room garments in a visible and organized manner, while at the same time removing particulate contamination from your garments as they are stored and removed. 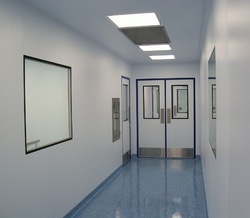 Our reliable workforce manufactures Modular Cleanroom, which have superior quality and are easy to operate and maintain. They are developed from suitable materials and custom manufactured as per client's specifications. Unique features like superior durability, customer oriented prices, long life and easy maintenance enhance their demand. These are designed in compliance with international quality standards using high grade factor inputs and cutting edge technology under the guidance of skilled professionals. Our offered range is extensively appreciated for high tensile strength, good conductivity, flexibility and durability. The main purposes of a Cleanroom HVAC Design Services are to help maintain good indoor air quality through adequate ventilation with filtration and provide thermal comfort.